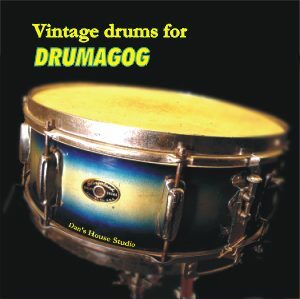 Originally released as a third-party drum library for Drumagog (Vintage Drums for Drumagog), the original sample set will be augmented with fresh cymbal samples and re-released as a virtual drum instrument for UVI Workstation. A full, 9 piece drum kit will be represented, with kick, snare, rack tom, floor tom, hi hat, two crashes and two ride cymbals. The samples will be accessed through two different interfaces, a simple “Build A Kit” interface and a “Mix A Kit” interface. You’ll be able to build a conventional kit by selecting the drums and iterations you want to use from dropdown menus, or you can mix your own sounds by blending the samples of as many drums as you want. “Build A Kit” will build a drum set by choosing a single kick, snare, rack and floor tom to trigger, but “Mix A Kit” will allow you to access all the drums simultaneously, so you can blend the drum sounds as you choose. So, let’s say you like the snap of the '1950s Rogers piccolo snare, but the ring of the Gretsch aluminum - using the “Mix” interface, you can mix them both in. We’ve got drums spanning the decades from the 1920s to the ‘80s, with Leedy, Ludwig, Eames, Slingerland, Gretsch, Pearl, Rogers, and Yamaha instruments in the mix, including a full Ludwig Club Date kit from 1967. As with all our samples, the drum sounds are unprocessed. No compression, eq, fx, gating, stretching, sweetening - just the pure sound of the real drum, with everything you need to pull out exactly the sound you want. As in the original, each of the ten snares has a total of 12 different iterations, with 5 round robin samples for each. For the basic four iterations, the snares are hit either in the center of the head, or off to the side with a standard stick, and were either muted or left wide open. So, “center, mute” will yield the driest sound, while “off-center, open” will yield a sound with maximum ring and tone. Each drum was sampled at five velocity levels. The remaining samples were all sampled at a single velocity level, with 5 round robin samples.